Put one cup of dumpling flour in a mixing bowl. A little at a time, add ~2 cups of cold water and stir briskly with chop sticks. The idea is that little dough balls that resemble spaetzle form as you mix. You never want to have wet goopy dough. When all the flour from the sides of the bowl is in dough ball form, you can knead them all together to make on big dough ball. Knead the ball until you have a smooth stretchy consistency. 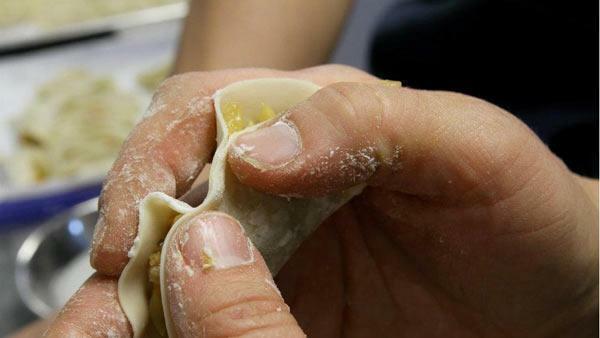 Then let it chill out for 20 minutes, covered, while you prepare the filling! Combine all of your wet ingredients with the ground pork in a large mixing bowl. Mix well. Next, add your dry ingredients and mix well. Lastly, thoroughly combine the chives, celery and scallion into your meat mixture. Make sure the scallions are the last addition and that you pleat your dumplings right away as the onions can contribute a slimy texture when marinating in the meat for too long. Now, go wake up your dough! Roll the dough in to a long snake about 1.5 inches in diameter. Set it horizontally on a well floured large cutting board in front of you. With a knife cut nuggets about 2 inches long rotating the snake 90 degrees back and forth after each cut. Start with just a few nuggets at first to see what size you like. Make sure your nuggets are well floured and round. Press them down with the palm of your hand so you have a round, flat disc shape. Next, use 3 fingers to hold the top edge of the disc so your fingers are pointing toward you. You are going to be rotating the disc counter-clockwise after each roll of your rolling pin which starts at the edge of the disc closest to you. Roll away from you toward your other hand. Do not roll over the entire disc! Stop in the middle. Then, rotate the disc counter clockwise degrees and roll to the middle again. Repeat until your edges are flat but the center has a little soft bulge. This is easier than it sounds! There is a very helpful video on www.asiandumplingtips.com. First, grab some friends. This is really fun to do in a group -- dumpling making party (that is how Chirba Chirba dumpling began). Assign some people to make wrappers, some to pleat, and then one to boil/steam! For the pleaters: take a spoonful of filling (start small and work your way up -- less filling is easier to pleat) and place it in the center of your wrapper. Here, you've got form and function to consider. The function of your pleat should be to seal the meat inside of the wrapper so that no filling can escape during the cooking process. You can do this simply by folding the wrapper over the filling in a half circle shape and pinching the edges closed. If you're using homemade wrappers you shouldn't need a binder. If you're using store-bought wrappers you'll need a little dish of water to wet the edges in order for the wrapper to stick to itself around the filling. Don't be discouraged, practice makes perfect! You can find lots of helpful videos online with different pleating techniques. Cook! Steam the dumplings for 10 minutes in a bamboo steamer basket on napa cabbage leaves. OR drop them into boiling water. When the water returns to a boil, add a cup of cold water. Repeat two more times. For more information about Chirba Chirba Dumplings visit www.chirbachirba.com.